Union County, NJ — The Union County Board of Chosen Freeholders would like to remind residents that immunizations are available to eligible children ages 2 months to 18 years of age without medical insurance at the Union County Immunization center, through the federal Vaccines for Children program. 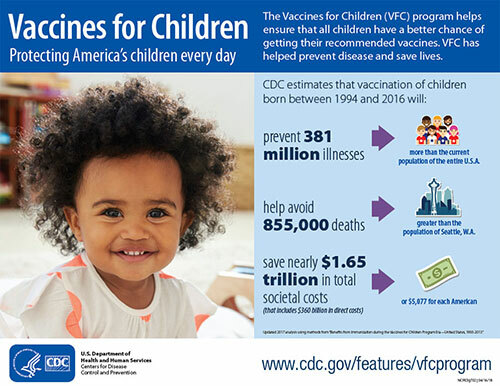 The Immunization Center provides information about available health services to families in need, screenings and more than a dozen immunizations for eligible children under age 18. Children who are uninsured or underinsured, or who receive Medicaid or N.J. Family Care are eligible for services. A total of 1,936 children were vaccinated in 2018 at the Union County Immunization Center. To receive vaccinations for a child, parents or guardians are required to provide the eligible child’s birth certificate, current vaccination records, parent or legal guardians ID. Legal guardians must also have guardianship papers from the Court. If the child is in school, a referral by a school nurse must be presented. To make an appointment at the Union County Immunization Center, to determine if a child qualifies for services, or to find out more about the program, call the Immunization Center weekdays during regular business hours at (908) 965-3627/3868.